This article from the Girl’s Own Paper, Dec 1911, just cracks me up. How could it not! 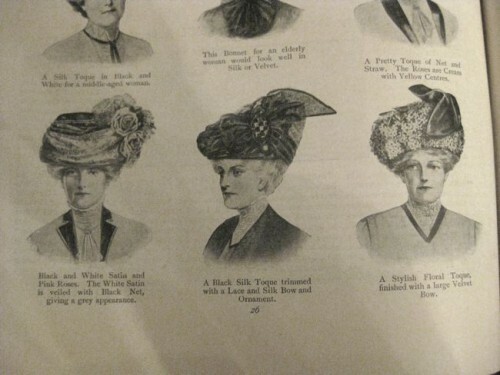 Clearly the hat fashion for ‘mature’ women in 1911 was a large, square turban-toque style. I wonder exactly what made these suitable for a woman of 50 (and presumable onward, based on the mention of ‘elderly’ in one caption). Was it just about the shape being considered properly staid, conservative and modest? Or was the shape thought to be more flattering? Certainly these hats all match the look that Queen Mary was famous for in the latter half of her life. And who was a better guide to respectable taste than the Queen? I wonder if these hats are designed to shift attention away from the face and any visible signs of ageing that might be there? They’re certainly attention-grabbing hats. I don’t think I would wear them at 50. But then, people didn’t live as long in those days and 50 was quite old, whereas now 50 is only middle aged, so when I imagine what I might wear at 50 I imagine things I could wear to work. Our ideas of age appropriate dress change too; I actually can’t imagine my clothing will change all that much over the next quarter-century (work will probably still involve suits, and casual will probably still be pants and a shirt). And yes, the article is funny. Mostly because it’s written so seriously, and then there’s that hat that looks like a lampshade, and I wonder whether the copy writer was giggling too. Lifespans ‘back then’ weren’t really much shorter than today. The lifespan average was skewed because there were a few life points that were particular hurdles: surviving infanthood, surviving childhood, surviving childbirth (if you were a women). If you managed these and did not have a job in any of the most pernicious fields (ie textile mills, mining, etc) you could easily expect to live beyond your 60s. The women targeted in this article are not likely to have worked in textile mills during their youths. However, I do think it’s absolutely true that we have a more vigourous, ‘youthful’ vision of 50 than society did in general prior to about, oh, 20-30 yrs ago. Thank you Carolyn. It’s so important to consider what ‘average’ actually meant in terms of lifespan. D’oh! That really should have occurred to me. I might try the hat for the elderly woman! Appropriate, even. A nice, tidy, wearable hat. The truncated gardsman’s hat top centre is an absolute hoot! They are funny, but just to play devil’s advocate a bit, at least they are recognising that women over fifty want to wear hats! 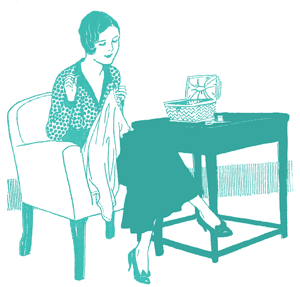 Articles about clothes for the older woman are thin on the ground, these days, as are the clothes. 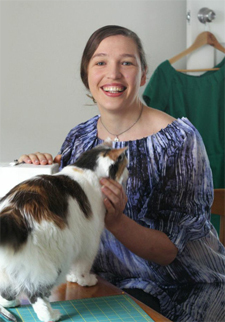 Try to find something that isn’t sleeveless or with teeny puff or cap sleeves – very difficulty. And there really is a use-by date on women’s upper arms! And various other bits. Those poor women look rather grim and pinched, though, don’t they? What happened to cheerful old ladies? 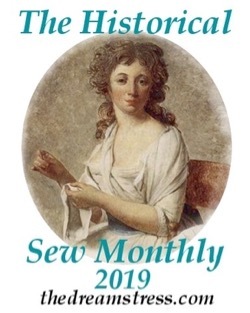 I have just registered that it is from The Girl’s Own Paper! Goodness me! How funny. I suspect they were considered age appropriate because they were more ‘sober’ and less frivolous than younger styles. 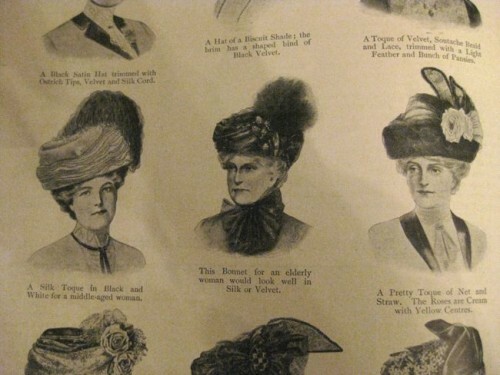 Also I notice that most of them add height to the wearer, as opposed to width – most fashionable hats were more in the “Merry Widow” style in 1911. Perhaps the idea was to draw attention away from the wearers’ middle aged spread? I’ve got to agree with with Lynne though that clothes for the older woman are thin on the ground these days – designers only ever seem to cater for wraith-thin teenagers. Gravity catches up with even the fittest and most health conscious of us! 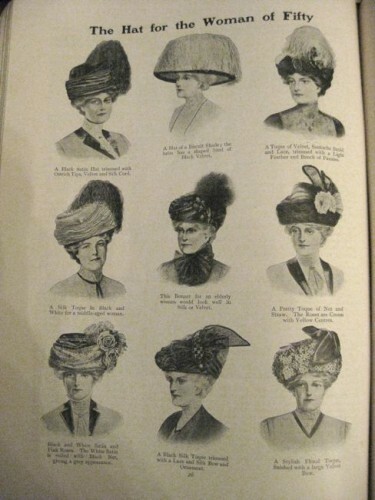 I could see The Dowager Dutchess, Violet Crawley wearing most of these hats and being able to carry them off. However, that lampshade in the center top row is just awful. I like the one bottom center. I could see it in shades of deep rose or sapphire blue. I thought of the Dowager Duchess too. Ha! “Lampshade” was my first thought too and I nearly cracked up. I was just about to comment to that effect, but I see you’ve beat me to it! And the Dowager Duchess as well, Maggie Smith would rock all the other hats! I was going to ask if we were sure that they hadn’t accidentally mistaken a lampshade for a hat when putting together the feature. As a former milliner, I understand this ad. It has to do with the role of hats that has nothing to do with fashion and everything to do with their function. They weren’t a mere accessory, but a tool in a society in which women had little literal voice. Hats marketed to younger women were either flirty (designed to catch, and/or control men) or ‘smart’ (meaning business like – including social business, which could be quite competitive).These hats, however, are designed for women who are unlikely to have a need for either. In a society where thre was a great stigma against marrying late ( or horrors, not at all) and a divorce rate that was very low ( and which came with social disgrace – making the return to a flirty style unseemly). This is also a demographic that presumably no longer needed a ‘smart’ hat to assist with jockeying into social position. These are hats for women who have finished with all that effort, and are now in a comfortable station of life. dowdy though they may be, they are strong hats, for they indicate success. What a wonderful, enlightening, well-articulated comment. 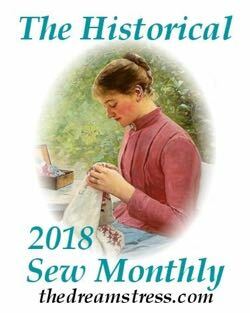 As a social historian of dress (albeit not this period) I really appreciate these types of insights. Thank you for sharing your knowledge! Maybe it is not the age of the wearer as much as it is the age of the fashion. I am 50 and find myself comforted by the fashions of my youth–that is the aesthetic I am drawn to. Could not the same be true of previous generations? I agree with Judi. What looks cute and lovely on my 22 year old niece would look absolutely idiotic on me and I would look and feel uncomfortable. I think it is a combo of what they feel comfortable in, the height of the hat elongating a face that may be starting to wrinkle and sag, and the height also adding an air of dignity and stature. But, mostly they don’t want to look like they still think they are 20-ie they don’t want to look nuts. 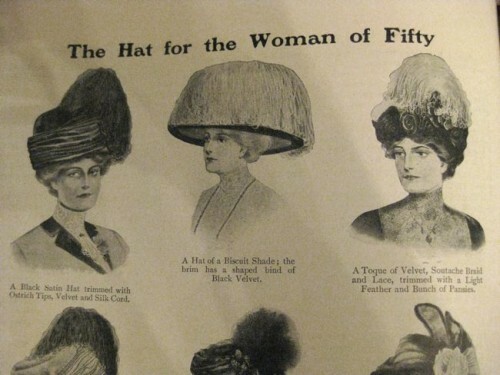 I am in my mid fifties and I would def wear almost all of those hats (the lampshade being the exception of course). For me I find the whole idea of age-appropriate hats very comforting. Fifty something is the age of transition from whatever you were in your youth to whatever you are to become in your old age… a time when the face in the mirror can be a shock each morning and the length of time it takes to get ready to go out gets longer and longer. Having an accepted ‘look’ that everyone agrees is suitable and stylish and if you like an ‘identity’ is rather appealing. I find being fifty something today neither fish nor fowl… just who or what am I supposed to dress like? Everyone says, just be yourself, but it can be hard to know who that is once you hit fifty! Of course everyone’s ‘fifty’ can come slightly earlier or later but I think most women eventually face this dilemma. Goodness, I am only three years away from being 50, and I wear big organza flowers and lace butterflies in my hair, which would be seriously frowned upon! hehehe. I think in these times, it is slightly more acceptable to allow personality to dictate more of one’s style rather than age but still there is a limit. Just this week I saw a woman with long salt and pepper hair with pig tails on either side of her head. And I stared and I stared. And I consider myself more tolerent than others. It just looked odd to me. I was thinking that an up do would have looked better…more dignified. “A Hat of a Biscuit Shade”! Not really my favourite – hard to decide, they’re all too over-the-top for the balancist me – but I’ve actually seen the Hat of a Biscuit Shade on a photo! And wondered about it for years. Now I know it’s the Hat of the Biscuit Shade! I’m closer to 60 than 50 (still wondering how that happened), and I am having a crisis right now regarding clothes. I don’t want to look like I am trying to recapture “my youth” but I certainly don’t want to look dowdy. So an article like this would be grab my attention. Being a hat lover, I would buy most of those hats, whether I would actually have occasion to wear them is another thing. The hats also seem like they aren’t trendy, something that would span seasons. which I think of as an adult sort of trait. The lampshade hat being the exception, they seem like the sort of accessory that makes people say “you look good” rather than “wow,what a great hat!”. I did notice that many of these matrons seem to have gray hair, which is uncommon these days. Mine is about 50/50 and it’s not fashionable at all. They look stern and powerful though, which is not the sort of look people go for currently. We all want to look young and fun,it seems.